Money is tight everywhere these days — and splurging on a meal is not something to do lightly. But splurging on a meal that you anticipate for months, and remember for a lifetime, is arguably worth saving for. So, twice a year we splurge a bit on a meal to remember — Valentines Day, and our Anniversary. This year for our anniversary we cleared off a credit card and for our “dinner to remember” we journeyed up the coast to the Hungry Cat in Santa Barbara looking for seafood to die for, and not only did we find amazing seafood, but other aspects of the meal including a re-invention of succotash and a lemon parfait of dreams made the trip more than worthwhile. We had a late reservation — 10 pm — and the restaurant was about 3/4 full. Hungry Cat is small, bistro-ish, with small wooden half booths pushed close together french cafe style. The service and atmosphere were excellent — our waitress knew the menu in depth and answered all our questions cheerfully knowledgeably. Prices were not outrageous — we came with the intent to spend the equivalent of about 4 “regular” dinners out, which meant a budget of $200 before tip, and in the end our bill was $185. Not bad when you consider what we had. We started with a made to order “plateau” of fresh seafood on ice, including a half dozen mixed raw oysters, a pair of marinated Santa Barbara mussels, a half ounce of American sturgeon caviar — and the piece de resistance, raw sea urchin in the shell. Truth to tell, it was the prospect of raw sea urchin that had prompted the trip to Santa Barbara and the Hungry Cat because Rena grew up eating raw sea urchin which she and her brothers caught in the rocks and tidepools along the short of the Leyte Gulf in her native Philippines. I’ve eaten “uni” most of my adult life, but had never had it from the shell and knew Rena would be thrilled. Neither of us were disappointed. 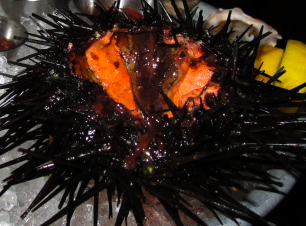 The sea urchin roe was flavoral, sweet, light — and to paraphrase a German friend who said of wild boar “you can taste the forest in it” — you could most definitely taste the ocean in the uni. Delightful, and beautifully presented. My caviar experience goes back to 2 years living in Moscow in the 1980’s when Black and Caspian Sea caviar was sporadically available at ridiculously low prices — a $150 tin for $15. I’d had the American version twice before and felt that it was almost indistinguishable (and about half the price). So for $30 we had a half ounce of sturgeon roe and we weren’t disappointed. Completely competitive with the Russian equivalent. But the thing that really set the appetizers apart were the Kusshi Oysters — the sweetest oysters I have ever had anywhere in the United States, on a par with the best I’ve had anywhere. These are oysters so delicious that it feels almost criminal to even drizzle lemon juice on it, much less vinegar or (no!) cocktail sauce. I could have eaten two dozen happily, but there was more to come. 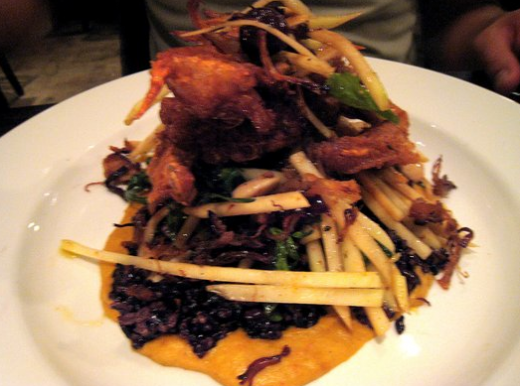 For our main course — Rena chose fried soft shell crab on a bed of black rice, crispy pork belly, almonds, shredded green papaya, and raisins. It was wonderful. The crab was crisp and flavorful and although we were a bit nervous about the pork belly — it too was crisp and flavorful and complemented the crab beautifully. The entire dish as unique, flavorful, beautiful to look at, and satisfying. 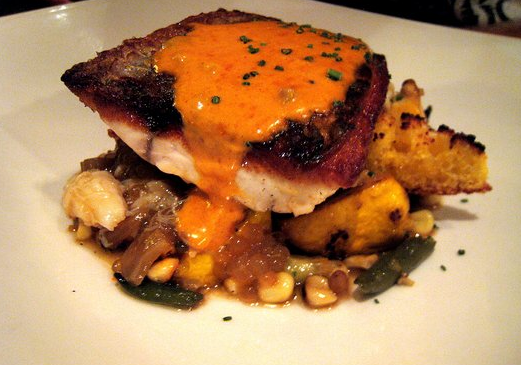 I chose the roasted redfish on a bed of succotash. The redfish was rich in a good way — meaty, moist – perfect. But it was the succotash that got my complete attention. I remamber having fresh succotash a few times when growing up in Alabama, but it only differed from the frozen “birds eye” version by virtue of the addition of lima beans to the corn, peas, and carrot mixture. But this …. to even call it succotash is to greatly underestimate the complexity and delicious combination of flavors produced by the combination of cornbread, peas, onions, fava beans, spinach, and crab pearls. 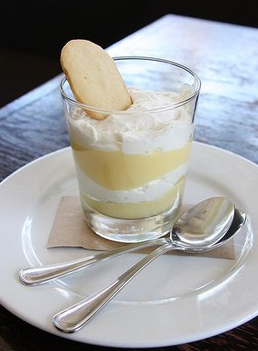 We finished it off with a lemon parfait/shortbread combination that was light, tart, and the perfectway to end a meal that we didn’t want to end. This was one for the the memory banks. Posting it here will keep it from being forgotten, although I doubt that’s a danger.